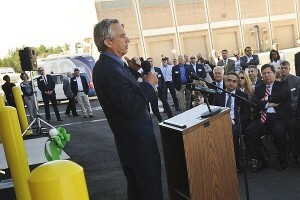 Robert F. Kennedy Jr. helped cut the ribbon on a new Gwinnett County facility which he said will work to protect precious water resources in the area. Kennedy has been a long-time protector of the environment and serves on the board of a company called Ostrara, which works to recover nutrients from waste water. In August, Gwinnett County started began operations at a new plant which a spokesperson said processes the recovery of phosphorus and other nutrients from waste water streams and transforms them into an environmentally responsible fertilizer, marketed as Crystal Green. “We’re thinking that the savings to the plant and the rate payer is about a million dollars per year,” said Jeff Boss with the Department of Water Resources in Gwinnett County. Boss said the county will sell the fertilizer produced and the entire project should pay for itself within 10 to 15 years.